Get professional designs in less time! 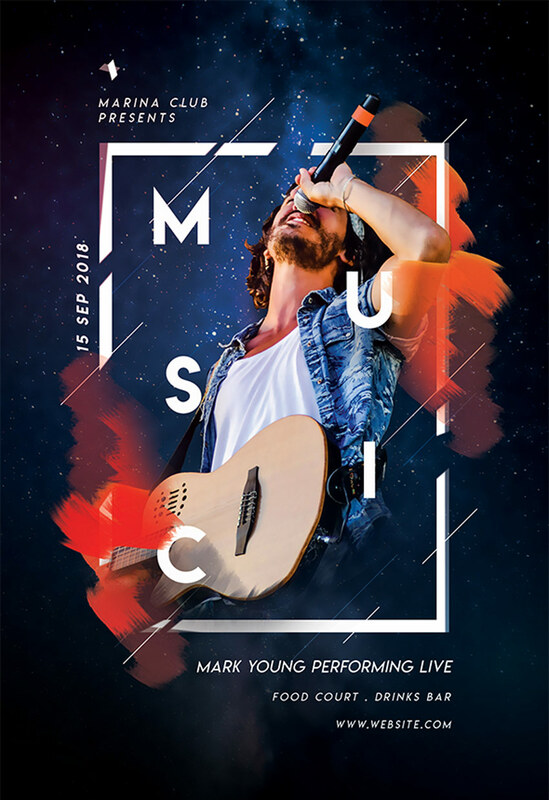 Check out these incredible flyer templates. Make 2019 a year to remember! 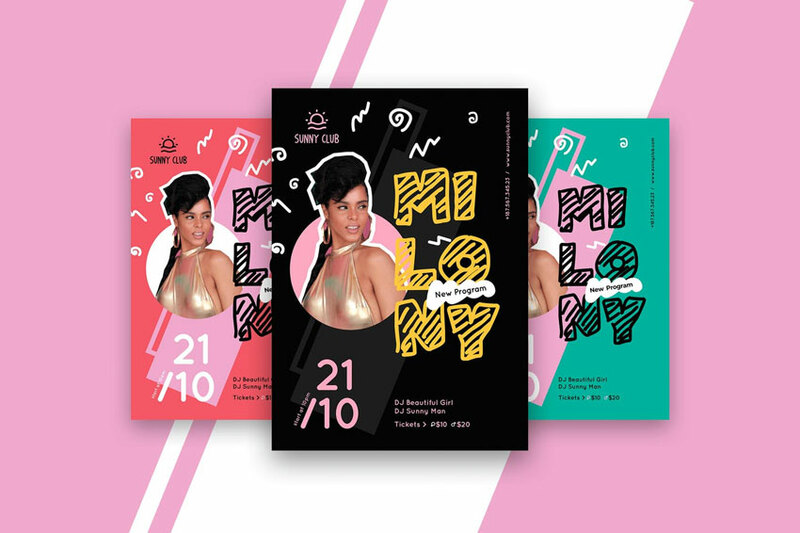 Kick off your festive celebrations with modern event flyers that are stunning and surreal. Today we bring you another wonderful collection of design assets from Envato Market and Envato Elements. 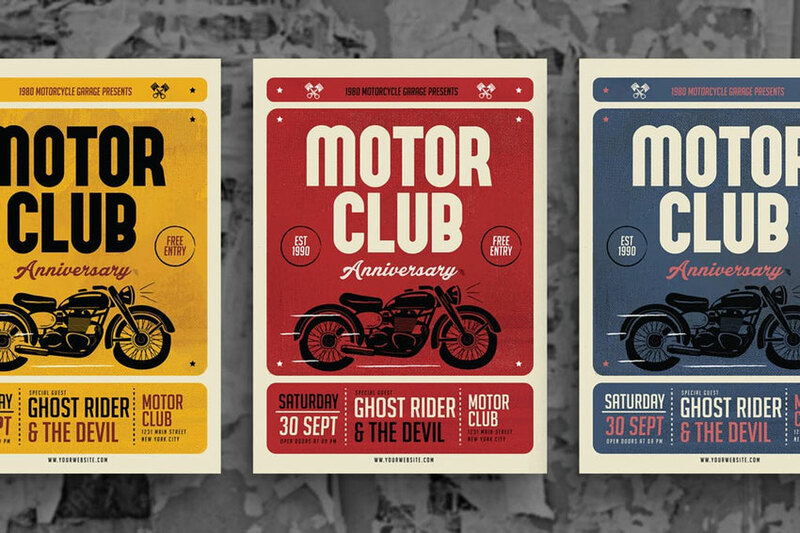 This selection includes awesome flyer designs featuring the latest trends in graphic design. 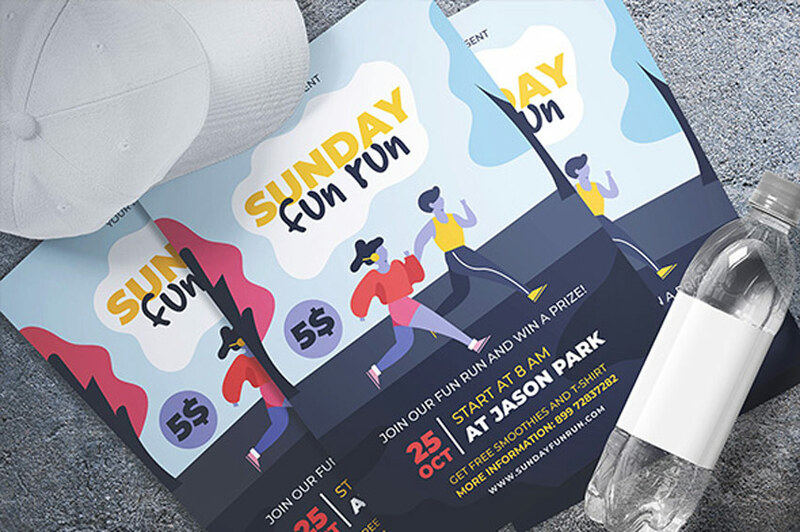 With choices ranging from awesome vintage-inspired templates to beautiful minimalist designs, you’ll be happy you went with these flyers. Take your events to the next level with these easy-to-use templates! 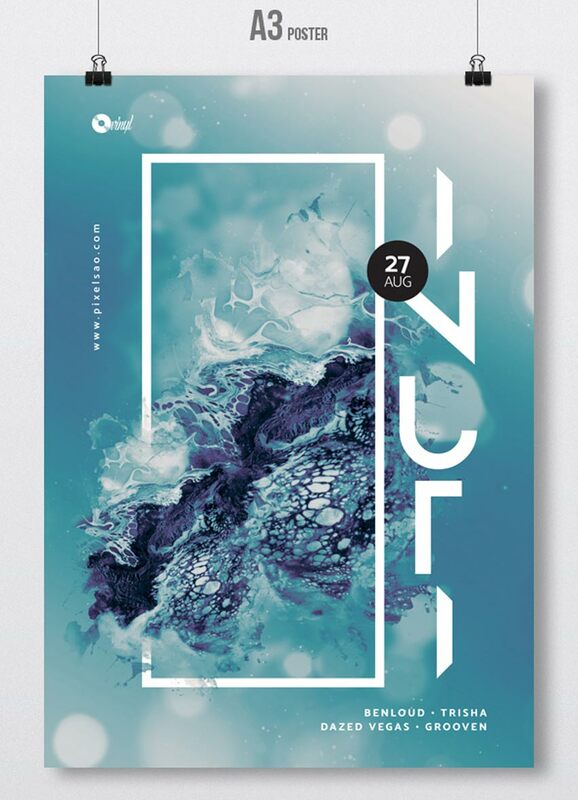 Multipurpose designs give you room to take your flyers to the next level. 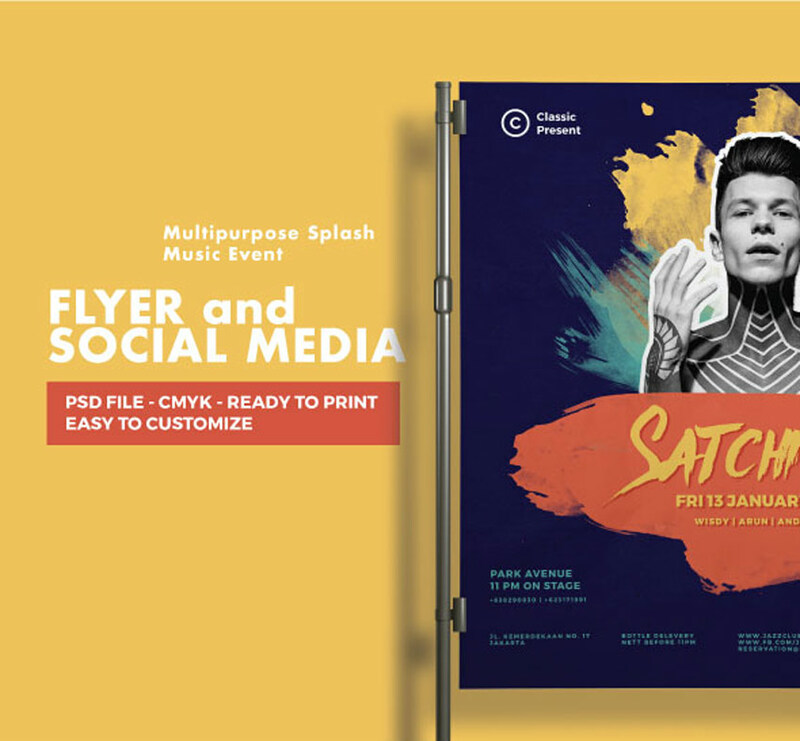 This colorful event flyer and social media package is a surefire way to kick-start your online campaigns. Enjoy high-quality A4 and letter format designs, with additional templates for Facebook and Instagram. Need something fast yet simple? 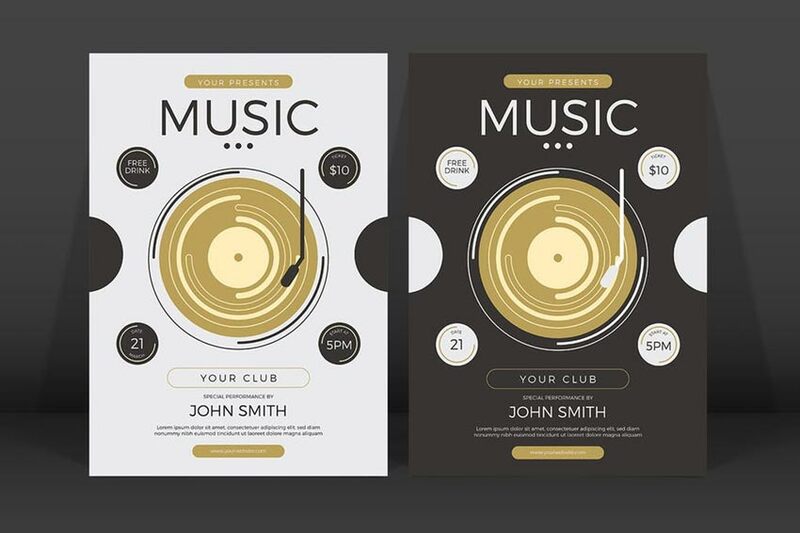 This brilliant minimalist flyer template has just the right balance of design and color. Use it for any jazz, club, or party event and easily update the text with editable layers. Download it now to try out the 100% vector design. Everyone needs a fun night out every once in a while. 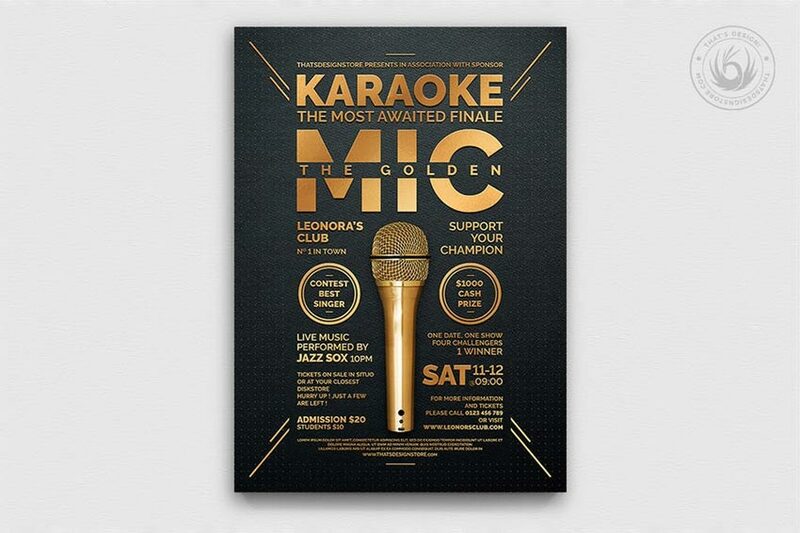 Celebrate great music and even greater company with this karaoke event flyer. This flyer comes with a print-ready file in a standard A4 size. Get free fonts and more when you download this template. Stand out from all the other DJs in town. 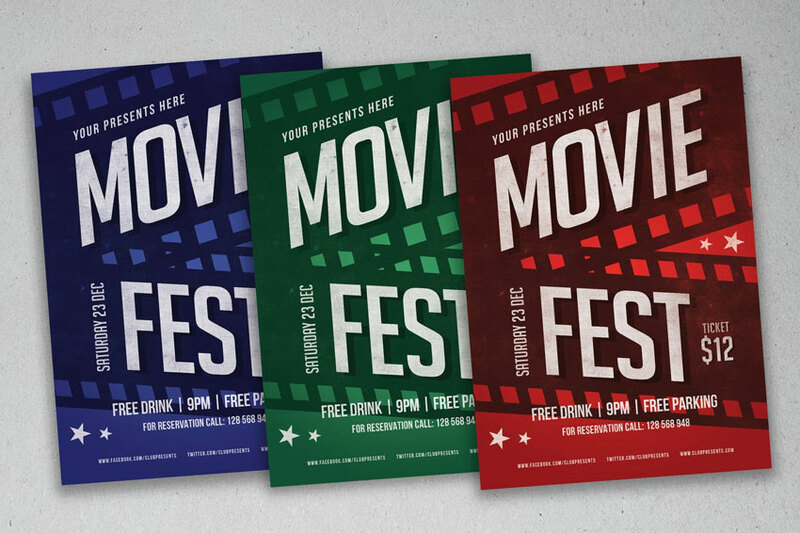 This fun flyer package features A3 sized posters with four color variations. Replace the main image with one of your own and match the colors to your brand. Give it a try! Did someone say house party? 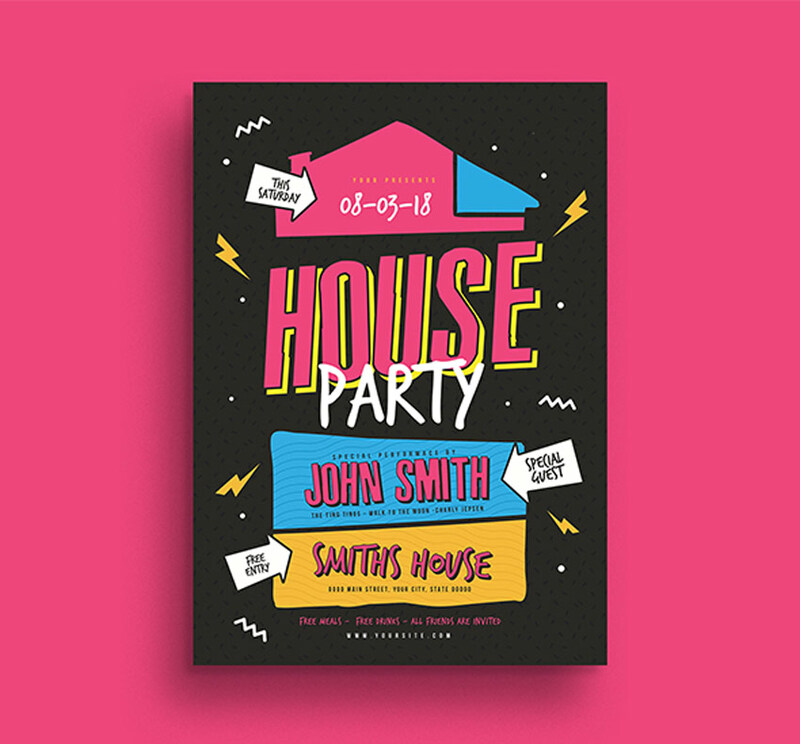 Invite your friends, family, and favorite Photoshop instructor to the party of the century with this awesome 80s-inspired design. Made to look like a blast from the past, this trendy design is nostalgic and fun. You’ll love this template! Get an entire promotional kit with this great deal! Packed with loads of awesome resources, this kit includes two print-ready Photoshop flyers, a Facebook cover, and optional Instagram banner. Easily arrange your content with editable layers and text. Try it out! Indie rock fans unite! We’ve got a wicked flyer ready for your next musical event. This modern design features minimalist text and elements centered around the main microphone. Update this file with your information using Adobe Photoshop or Illustrator. 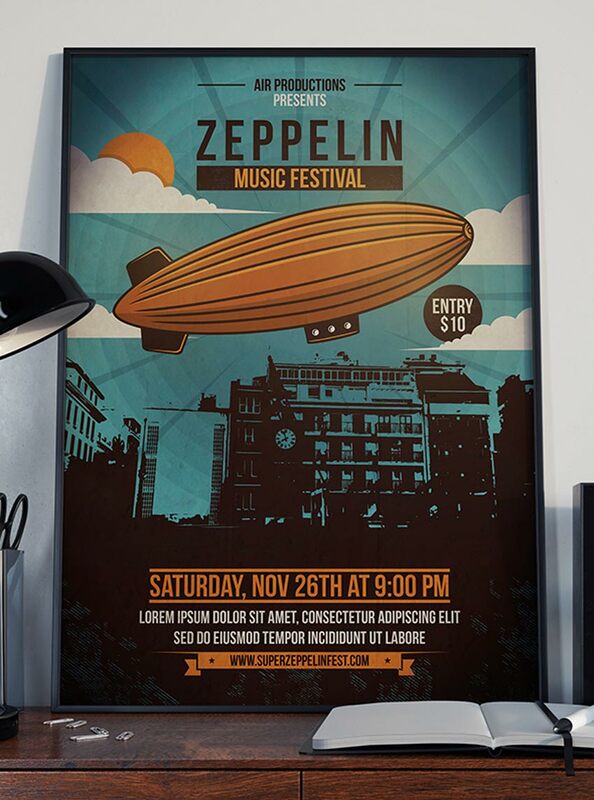 For the vintage music enthusiast, you’ll definitely love this Sky Zeppelin flyer. It works perfectly as an event flyer or as a cool decoration for your home or office. And since it’s created in traditional CMYK format, you won’t have to worry about loss of color or quality. Get ready to lace up your ice skates for a magical time! This party flyer features a sleek and minimalist design with ample room for your event details. It’s designed with Adobe Photoshop, and you’ll get one other color variation with helpful bleed lines. Download it today! Or blow away your party-goers with an epic abstract design. 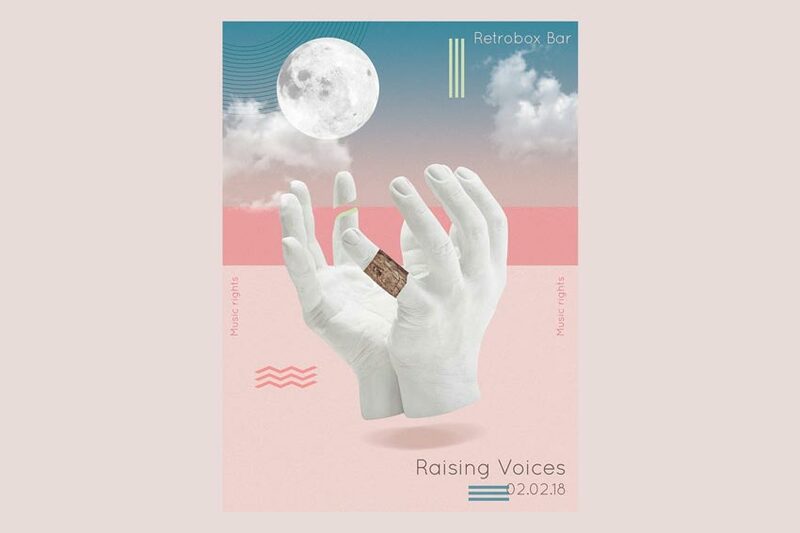 This party flyer is best suited for high-energy techno music and more. The full package includes not only a professional A3 Photoshop poster, but also a web banner template. You’ll want this design! 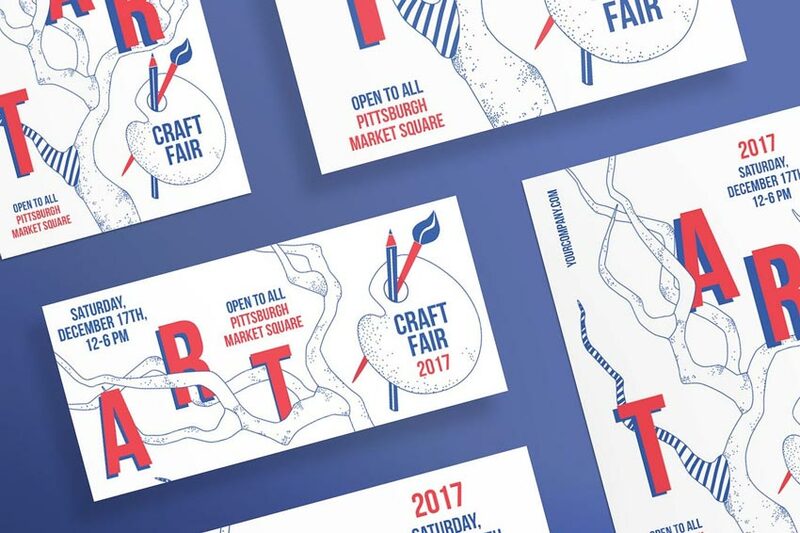 Help your community get crafty with this awesome flyer template. This modern design is pretty universal for any art or craft event and can be edited fast to save valuable time. Download this super clean design to get access to four Photoshop files. Kick off your special cause with an afternoon of running! This next event flyer template is great for beginners to design. It features well-organized files that are easy to customize. Get access to two flyer templates available in both Photoshop and Illustrator formats for under $10! Make a child’s day today! 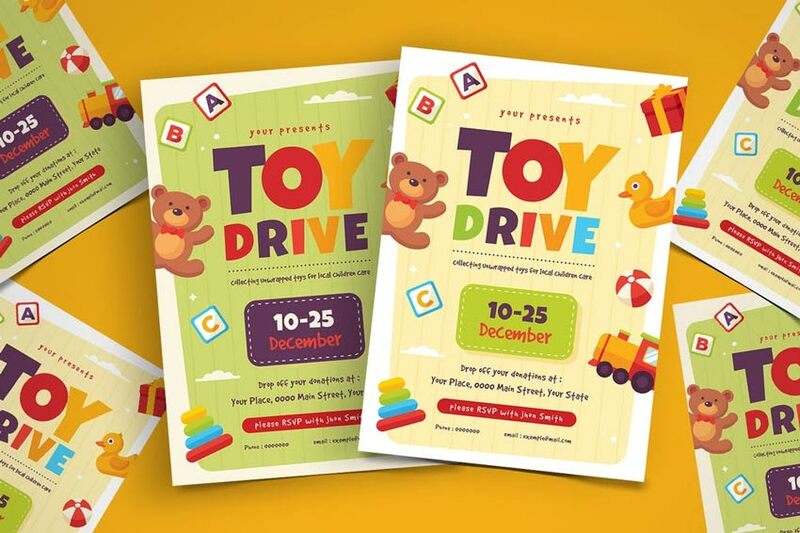 Get your friends and community together for a special cause with this flyer template. Designed with friendly stuffed animals and more, this flyer is one that both kids and parents will love! 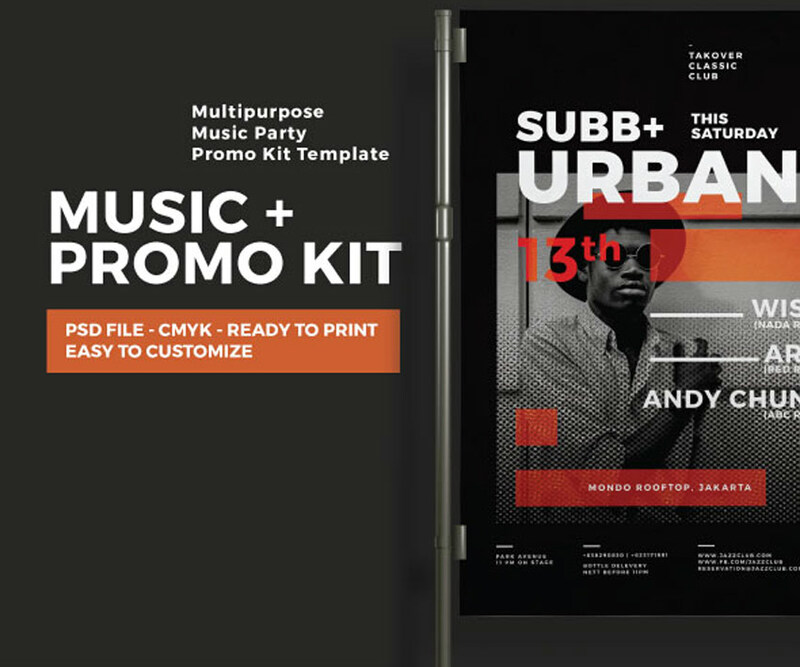 Download A4 sized templates supported by Photoshop and Illustrator. If a clean and professional design is what you need then feast your eyes on this stunning example! 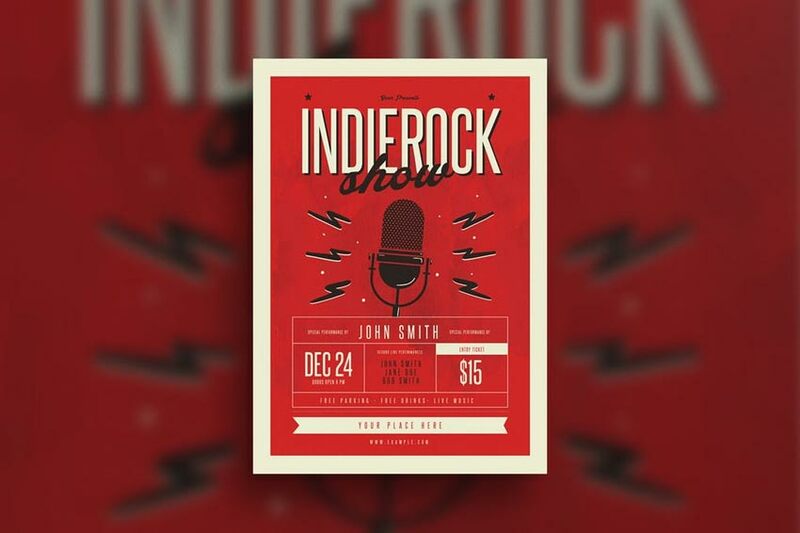 This lovely event flyer features a relaxing color scheme with a gorgeous, minimalist guitar. The multipurpose design is well organized and even includes free fonts and icons! Or raise your voice with an inspiring design. 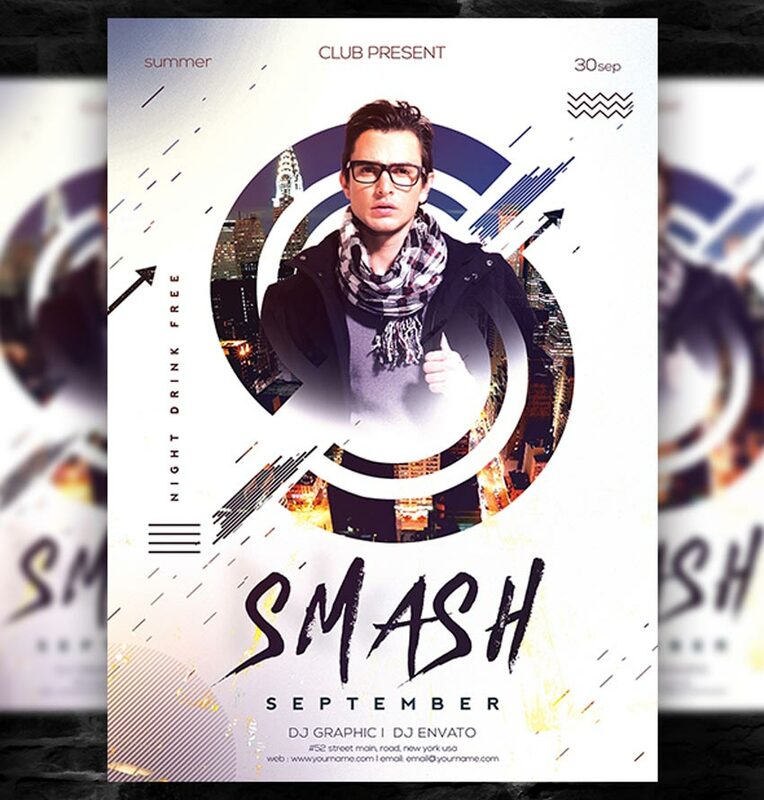 Inspired by the latest trends in 3D and pastel graphics, this flyer template is so beautiful and also well organized. Modify the images, colors and text fast so you have more time for event planning. Check it out! The world could use a little more peace. Spread love with this spiritual-themed event flyer. Designed with a peaceful landscape and sublime color scheme, this flyer is 6×8 inches with all the standard industry specifications. Use it for conferences, events, or prayer services. Need to promote your next gig? 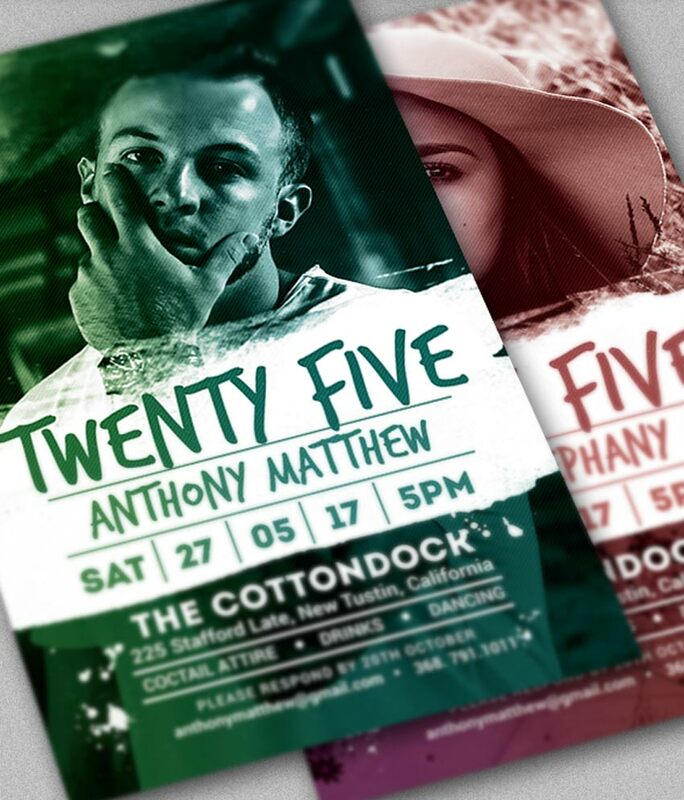 Bring a wider audience to your open mic or music festival with this event flyer template. This template features two background options along with easily editable smart objects. Helpful instructions are also included. Business events bring creative entrepreneurs together. 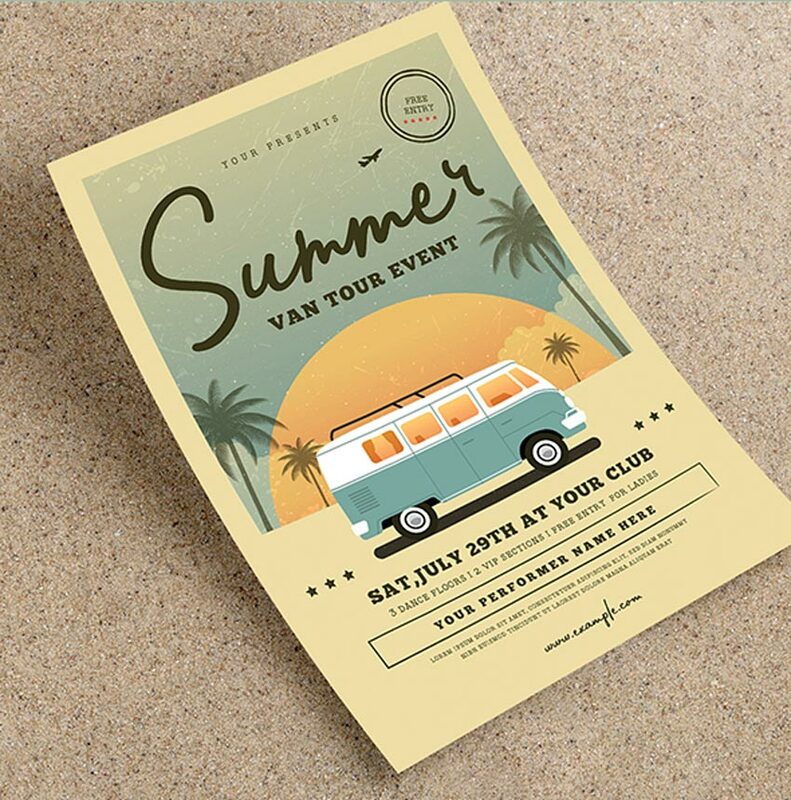 Now you can start your own with this stylish event flyer template. Following the latest trends in minimalism, this template features beautiful gradients against a dark background. Update it fast in Adobe Photoshop. 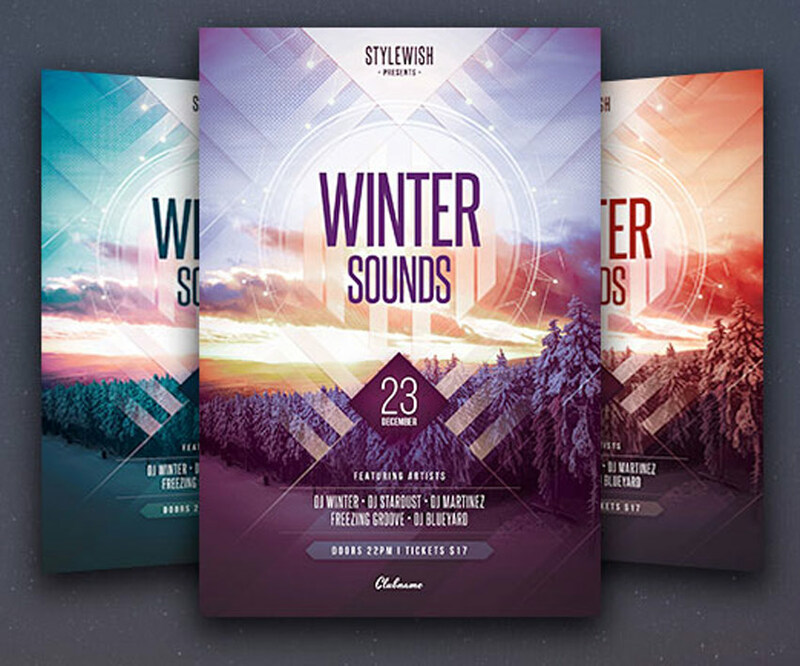 If you’re having trouble deciding on a design, then try a professional flyer template bundle. This stunning design features a winter theme with beautiful abstract elements. Easily switch out the text for your own and choose from the three lovely color variations included. Tell your buddies to tag along for a fun motor club event! This awesome bundle includes Photoshop and Illustrator supported files that are 100% vector. Also included are free fonts and helpful bleed lines for your convenience. Our next design features a beautiful vector illustration of a calm vintage summer scene. Use it for your next tour or festival by swapping out the event details for your own. Get access to Photoshop and Illustrator files in one easy download. Your birthday is a special event, so celebrate it with all your loved ones! 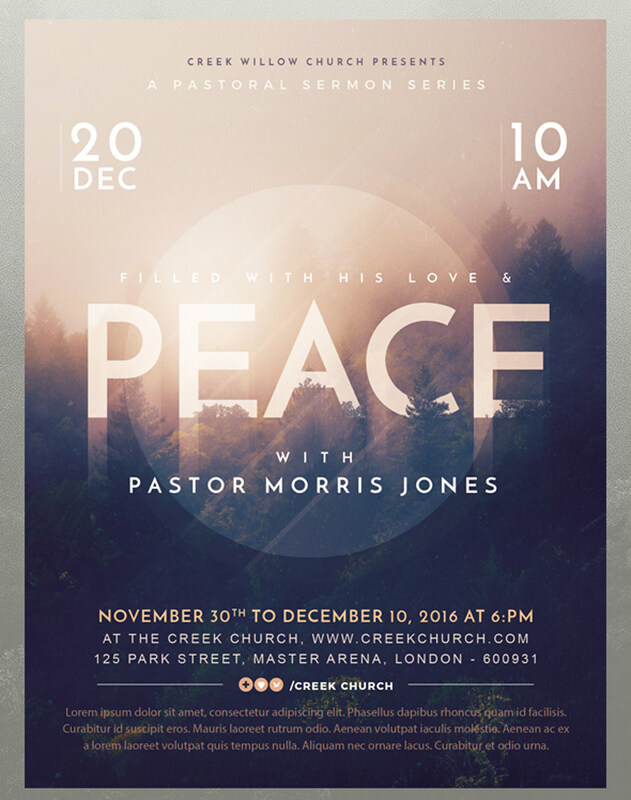 This modern design features two well-organized flyers with easily editable layers. Just swap out one of the images for one of your own to get started right away! Promote your gallery event with style. 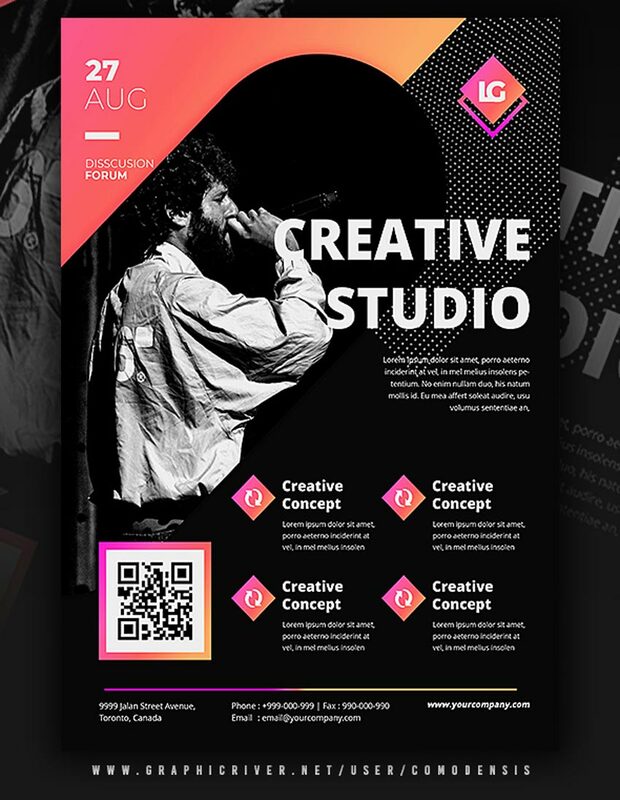 This next flyer template is great for artists and creatives. Just add your image to the center portrait before including the details you need for the event. This download comes with two Photoshop files, free fonts and more. 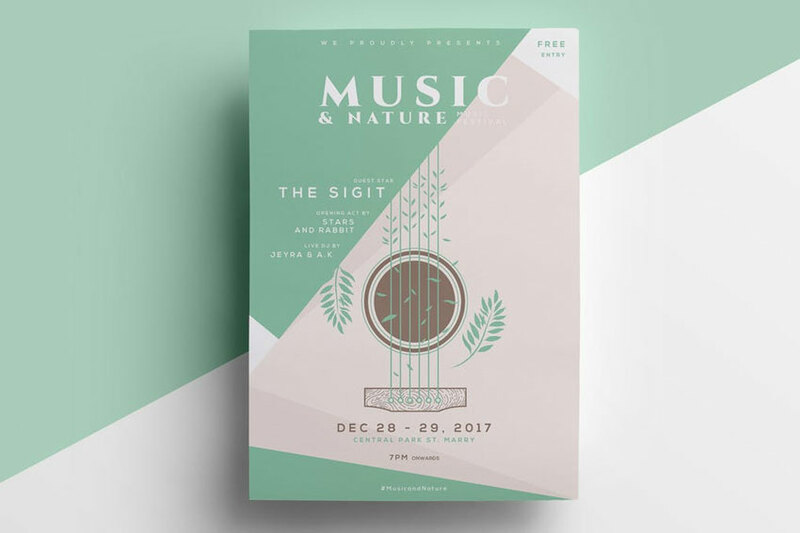 Music festival flyers get the community excited about local events. 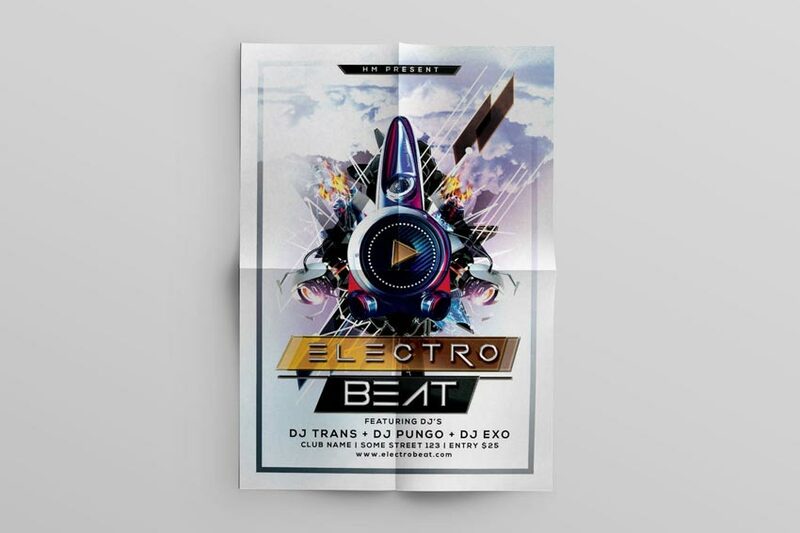 Now you can add something to the mix with this electric music flyer template. Great for DJs or party promoters, this template is simple and easy to use. Add it to your collection! Movie nights are the best nights! 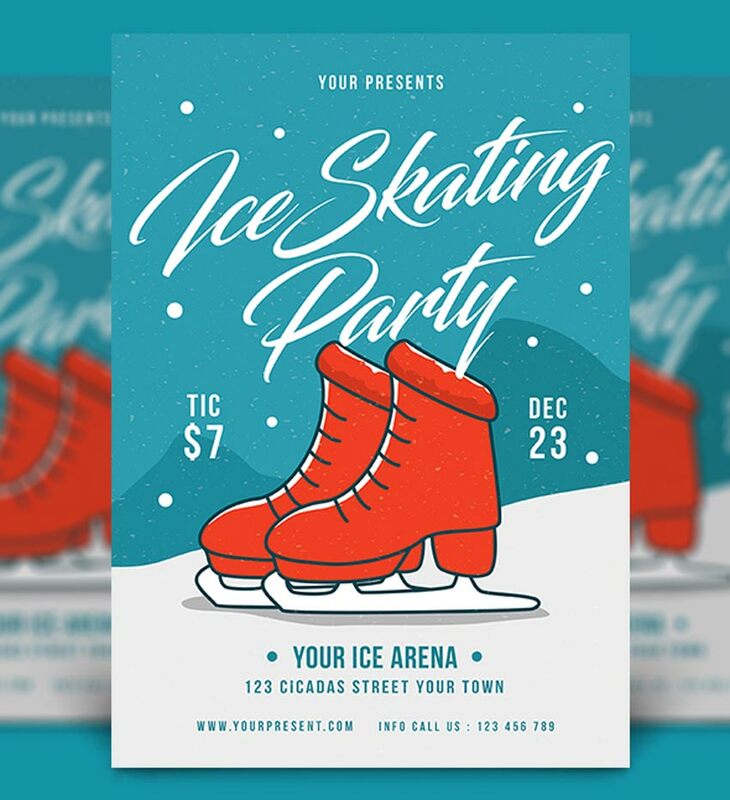 This Photoshop template is perfect for beginners to flyer design. Choose from the red, green, and blue colors included or update it with your own in minutes! Not sure where to begin? Just access helpful documentation to help you get started. Valentine’s Day is a day for love and romance. 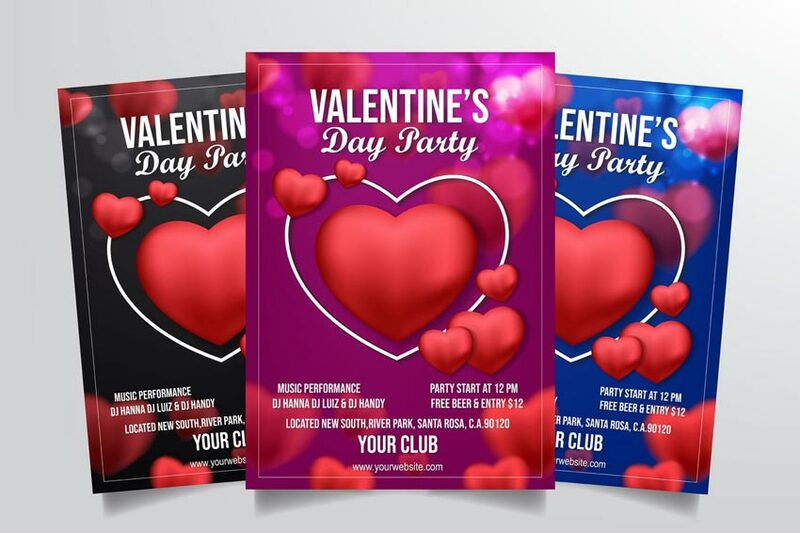 Now you can promote your romantic event with this lovely party flyer template. Available in Adobe Illustrator format, this template includes three alternate colors for black, pink and blue versions. Mix and match to get the best result! Or promote your local specials with this vintage flyer. 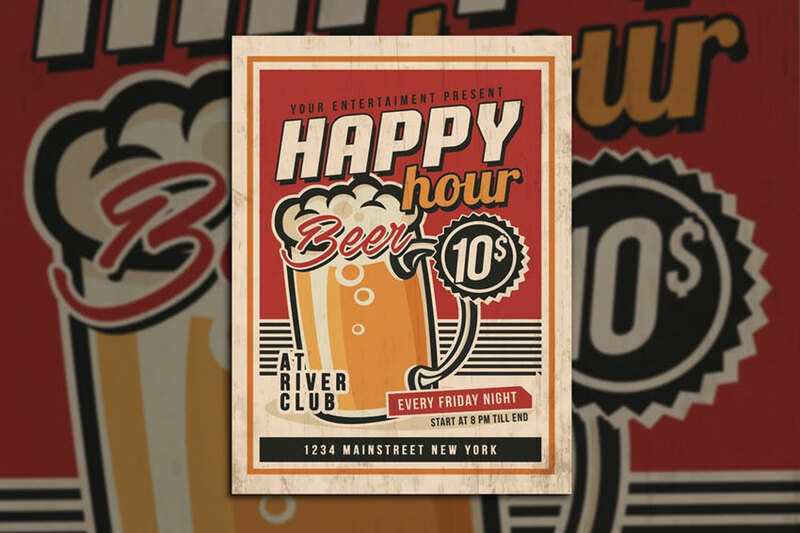 Designed using Adobe Photoshop, this flyer is print-ready, with bleed lines and more. Easily change the colors or edit the text to your liking. Try it out today!